Elegant Engagements Wedding and Event Planners: Loving Ballard Again! There is not much I don't love from Ballard Designs. How about a Fresh Cedar Alphabet Wreath for your front door or for the doors of your church - what a nice way to welcome your guests. 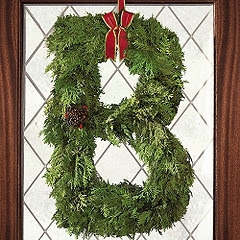 Now if you want to keep it year after year you should look at the PVC Spruce wreath they also sell. Love this idea now I just wish I had a winter wedding to plan. This is SO great. I wonder if I could swing this for a fall wedding? Maybe something similar in a autumn inspired material? Regardless, i LOVE this wreath.